After a crowd of at least 300 Naxals closed in on paramilitary commandos, ambushing them in the thick forest of Chhattisgarh's Sukma district, the Air Force swooped in to help, with its helicopters landing in the heart of a Maoist stronghold, despite concerns of the insurgents opening fire. The unarmed transport helicopters helped evacuate the soldiers that had been injured. By then, the attack - the worst in seven years on security forces in the state - had crossed three hours, revealed DM Awasthi, the Director General of Maoist Operations of the Chhattisgarh Police. 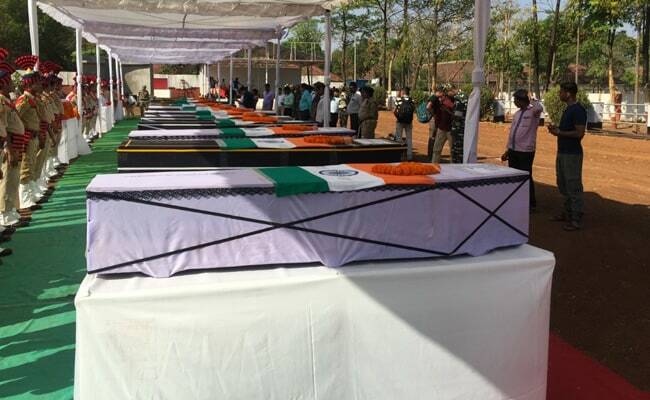 25 members of the Central Reserve Police Force or CRPF were killed yesterday. Six others were critically injured and evacuated by helicopter to Raipur, where Home Minister Rajnath Singh visited them in hospital today. The CRPF contingent of about 100 people was guarding road workers, when they came under heavy fire from the Naxals. Women were among the attackers. Most of the commandos who died were part of a group of about 25 that had sat down for a quick lunch break, disclosed Mr Awasthi. The road that was under construction is planned as a major highway in South Bastar, one of the most under-developed areas of the country. PM Narendra Modi said the attack on the patrol party of the CRPF was cowardly. As the 25 CRPF jawans on their lunch break were attacked, the others fought back immediately. A soldier who survived the attack, Sher Mohammed, said from his hospital bed, "They had rocket launchers...automatic weapons, AK47s..." But Mr Awasthi denied the use of either rocket launchers or IEDs or Improvised Explosive Devices. Like Sher Mohammed, he said several Maoists were killed without revealing a count, and that the insurgents who escaped managed to swipe AK47s from the CRPF commandos. The Maoists had observed the CRPF's routine for over a week, said Mr Awasthi, stating that they "knew exactly when and where to attack." For the CRPF operating in areas infested with Maoists, it is standard procedure to mix up routines and routes to prevent exactly what happened yesterday. The Home Minister has called a meeting on May 8 of top officials from states like Chhattisgarh who are vulnerable to Maoists. He warned that "we may revise strategy" to deal with the insurgency, and pledged that "the sacrifices of those who died will not be in vain." The Maoists, who claim to be protectors of tribals and their rights, regularly attack patrol parties and those involved with building new roads and infrastructure in the remote areas because it undermines their claim against the state. "There were 38 civilian contractors present yesterday, not one civilian died, the jawans fought to save them," said Mr Awasthi, emphasizing the heroic bravery of the commandos.